With Alex Waller seemingly so robust that he could play every game for Saints, Francois van Wyk must have been wondering when his big chance would come. 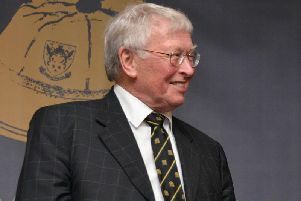 Waller had established himself as an immovable presence at Franklin's Gardens as he racked up a record number of consecutive appearances. But after injury finally struck halfway through the 2017/18 season, which was van Wyk's first at Saints, the South African got a chance to show what he was made of. The problem was, that Saints were in the midst of a horrible run of form that would result in the departure of director of rugby Jim Mallinder. And after starting the two games following Waller's arm injury against Newcastle Falcons on December 1, van Wyk was back on the bench, replaced in the team by Campese Ma'afu. The two games van Wyk played were Mallinder's final match in charge - the 43-32 home defeat to Ospreys - and the 32-15 defeat to the same side a week later. The loosehead prop was never really able to establish himself in the Saints side during his first season and he has had to wait until recently to really make his mark. Van Wyk hadn't scored for Saints before he delivered a double in the Premiership Rugby Cup success against Bristol Bears in October, catapulting him into the Gardens spotlight. And he has taken that confidence to impress in recent months, with his showing against a mighty Clermont Auvergne pack in January really showing he had arrived. He played for 76 minutes in the 47-20 win against Leicester Tigers last week, which provided more evidence that the coaches have real faith in him. And van Wyk is now really starting to feel at home at the Saints. "It's been good so far this season - I've played quite a bit," said the 27-year-old. "I've been getting some starts under my belt and I just want to build on that and get more consistent during the season. "I feel like I've got good backing from the coaches and the players around me help me quite a bit. "Alex Waller and Ferg (scrum coach Matt Ferguson) have been really good." Van Wyk is now just one start shy of the six he managed during the entirety of last season. And he added: "It's 100 per cent a big time for me. "You always want to start and hopefully I can bring something to the team and really put my best foot forward." When Waller was appointed co-captain last summer, van Wyk must have feared he would play even less this season. But that hasn't been the case, and the pair are working well together. "It's always been a good competition and there's never any hard feelings between us," van Wyk said. "We've got a great relationship and we help each other quite often. "We just want to bring the best out of each other and get the best for the team." The backing of the coaches has clearly meant a lot to van Wyk, and he is especially enjoying working with Phil Dowson, who became forwards coach last summer. "Dows has been excellent," he said. "He's been a player before so he understands everything and he's just driving high standards, which is one thing we maybe lacked last year. "Dows is hammering on that so it's been good. "Dows has got a great relationship with all the players." The bonus-point win against Leicester last weekend propelled Saints into the Premiership Rugby Cup semi-finals. And former Western Force front row forward van Wyk said: "Northampton Saints have been quite successful in previous years so for us to get trophies back at the Gardens will be amazing."